Megan was great. The class was really informative. My wife and I felt confident we could save a life when we left. I think everyone should take this class. Had to get CPR certification for new job. Had gotten it years ago thru church. This session was very informative and fun and quick. I think I got more out of it and felt more confident about CPR than before. Highly recommend this program. Megan is extremely intelligent and flexible in helping me renew my certifications on my busy schedule. Great quality service while leaving confident in your newfound skills! Megan Irvine with OC-CPR was awesome! She came to our school site and trained an entire group of staff members in our school cafeteria and I learned so much while having fun! She was extremely knowledgeable, outgoing, informative and funny. She made learning CPR fun and interactive and I highly recommend that you use this company to train those in need of CPR training. Thanks Megan! - The instructor answered everyone's questions like it was the most important question of the training. Which is huge for the self esteem of everyday citizens who know nothing about emergency medical assistance. - The instructor's explanations of CPR practices and procedures, as outlined by the American Heart Association, were logical and practical. - The instructor was personable, which is probably why everyone felt comfortable asking questions. The overall sense I got from the training was that assistance, even with mistakes (and in an emergency, that could happen because stress is high), is infinitely better than no assistance. And while I personally hope I never have to use this training, I do believe that I am more confident if I have to intervene. I would definitely seek recertification from this instructor and recommend her to others. Highly recommend this service. Megan makes the information fun, informative and the process painless..... Would retake again when its due. Oc-CPR was awesome. I was in a pinch and had to get my BLS certification done very last minute. Megan was helpful and responsive and worked with my very tight time line. It was easy and convenient. I am super grateful she was available!!! Thank you OC-CPR!!!!! I highly recommend OC-CPR for all of your CPR Courses. This is the BEST Place to Get your CPR/ BLS certification!! Megan is a great instructor!! She teaches her classes with enthusiasm and She is very Knowledgeable!! She was also very helpful getting my CE certificate!! Excellent class. Straight to the point and the instructor is very informative, nice and funny. Worth the money and covers everything you need to know about CPR! Awesome course and very informative... The price was fantastic... I took the BLS course... Highly recommend this place! I have done 4 BLS renewals with Megan over the past 8 years. The first two were the traditional classes and then the most recent two were through the online module with the short in-person skills testing. Seriously, online is the way to go! I did the course in the comfort of my home and took breaks when I needed. Then I literally texted Megan and told her I was ready for skills testing and boom...she had me in the next day for 10 minutes (during my lunch hour) and I was done!. I will never do another traditional CPR class!!! Megan is so easy to work with and super responsive. I'll be seeing her again in two years for my next renewal! Thank you!!! Great response during the booking process, very knowledgeable and friendly. Excellent instructors who made the class educational yet fun. Very reasonably priced. Would recommend to anyone. I've always wanted to take this course and so glad I did; so much crucial training that can easily save someones life. How pathetic would it be if a lifesaving opportunity was presented to you and you didn't know what to do! Megan is great! She was flexible and had a no-nonsense approach to this training. She made everyone comfortable in class and taught us the information perfectly so that me and everyone was clear on what they needed to know. I took the BLS refresher class this week. The instructor did an excellent job of making sure everyone knew proper techniques. It was a small class and very hands on. It gave the students valuable 1:1 time with the instructor. You will get your certification card the same day which is super convenient! I took a class here years ago and needed a refresher course for my job asap. I found the class I needed the next day. So easy! Helpful people great classes. I was so happy they were still here. I needed to renew my CPR card for my work and found Megan class on American Heart Association website. I Love how small the class is. Very hands on. Megan is very knowledgable and she makes the class fun! I attend one of Megan's CPR/First Aid courses and it was fabulous! Previously, I had taken CPR courses over the years, but none of those courses discussed "real world" situations. Megan demonstrated what to do, then each student in the course had hands-on practice of what we learned. Megan not only taught us HOW to do each procedure, she explained WHY we were doing each procedure. Everything just makes so much more sense now! I left the course remembering what to do and feeling confident that I could perform the necessary steps in an emergency. Thank You Megan---You're the Best! 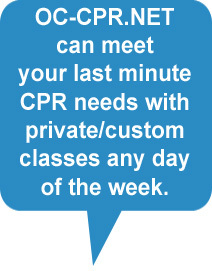 I needed to renew my BLS and found OC-CPR on yelp. At first it was a little odd that the course was held at the instructor's home. But it ended up being the best CPR course I've taken to date. Megan had us in and out in less than 2 hours! I felt like I learned so much more from Megan than other longer courses I've taken in the past. She's practical, cuts to the chase, skips the long video, and teaches us exactly what we need to know. I really appreciate her awareness of the non-ideal nature of emergency situations. She emphasized the importance of modifying procedures and making adjustments as necessary depending on the environment. The real-life examples she shared also really helped illustrate the practical application of CPR. Good price ($60) and she didn't make us buy the handbook (I never read my previous ones anyway). Excellent course and highly recommended! Megan is great! I was referred to her by Gracie. Megan was able to work with my schedule and communicate with me every step of the way with exactly what I needed in order to complete my recertification. She made everyone comfortable in class and taught us the information beautifully so that everyone was clear on what they needed to know. I would 100% recommend her and will be taking it again in two years when I need to renew! Best CPR class I have taken so far. Megan is personable and a natural at teaching. All the important points were presented in a way that made them easy to understand and remember. If you are shopping around for BLS classes, look no further. Great teacher, great time management, great customer service, great company. Megan is 100% legit, professional, timely, and a delight to work with! Her schedule is super flexible, and I was able to be in and out of her home in an hour and a half for CPR & First Aid recert! Awesome for me and my busy working schedule! Fun, informative, educational and awesome! I needed to get re-certified in CPR/AED/First Aid, and now that I have a baby, getting out of the house for several hours is tough and expensive. So, Megan came to our house for the class, and the experience couldn't have been more perfect. Megan was super friendly, professional, patient, and thorough. Her knowledge of CPR and First Aid was up-to-date, and since she also has children and is a nurse, she had wonderful first-hand experience, so she was able to elaborate on key skills and demonstrate extra helpful tips. My husband and I finished the class feeling much more confident in basic life-saving skills and First Aid management for adults and young children. Thanks Megan for a job well done! Quick and easy to get my BLS. Megan was friendly and professional. I ended up losing my card and she worked with me to get it replaced ASAP. I will definitely return to recert. HORRIBLE PLACE. DON'T GO THERE!!! I signed up for a CPR class on line. My class was scheduled at 11:30 on Saturday in Irvine. The day before the class, Megan called me and left a message saying that they have to change the location of the class because there was a problem with the building. Things happen, so I was OK with that. She said I can go to the Huntington Beach class on Saturday at 1:00 PM. She said the time clearly and it's still on my cell phone. Since I was working all day on Friday, I couldn't call her back but when I called her on Saturday at 12:00, she said the class had already started and finishing at 1:00. She told me I didn't call her back, so she wasn't sure if I was coming. She should have let me know if she changed the time since she just changed the location the day before. When I told her I was working all day and couldn't call her back, she said everybody else called her back but me. Her tone was very unprofessional and rude. Megan, then told me I could still go there, but the instructor will have to stay just for me because I didn't call her back sooner. You can't change the location the day before and expect everybody to call her back right away. I also told her she should have let me know if she changed the time. Then she yelled at me " I didn't change the time!!" No apologizing. Well, I checked my voice mail again. It clearly says 1:00 PM. Very poor customer service. Then she complained that she had to call the instructor to stay longer because I called her back late. She also told me "Everybody is gonna be gone, so you will be all by yourself." I cannot believe how she would speak to a customer in this manner. When I went to the class, the instructor was there. I had her listen to the voice mail from Megan because I wanted to let her know that she had to stay because Megan told me the wrong time. Then I found out that the class actually started at 9:00. Horrible business. I will tell all the health care professionals I know not to go there. Gracie is such a great BLS CPR teacher--- this was my first time renewing my BLS CPR for my OT program, and it was such an easy process. I really like how it was part online (approximately 2 hours if you go through all the required and non-required modules) and about an 1-1.5 hours of lab time, which was SO much more efficient than the last class I took where it was entirely in the classroom. Also, I liked how it was a small class... our class had only 3 people in it, and from my understanding, I don't think she takes more than 6 people at a time. Small classes are great because you get more help from the instructor. She is super chill too, and definitely ensures that you understand the material. I have already told my entire program about her at CSUDH because she is so good. Overall, I feel very confident in my CPR skills thanks to Gracie. Oh yea, you also get your CPR card immediately after completing the class. Gracie was an exceptional teacher and I'm so thankful to have taken the class by her. From the first phone call contact, she was knowledgeable, helpful and honest. She will make sure that you take the exact class you need and know it well by the time you leave. Much better than rushing through the information when you're learning how to save someone from a possible life or death! Highly recommend! I had my ACLS renewal with CPR Live this year. Gracie was very quick to respond to my inquiries via email and phone. The skills testing was quick and painless, there were only four of us at the class and it lasted about 45minutes. You get your renewal card right after the course. The online course was time consuming though, the case exams in particular were painstaking--I wouldn't recommend it for first timers who are just getting their ACLS certification. The only good thing is that you can do at your own time at home. It took me about six hours to complete the online course. The cost is alot more than most classroom courses. I initially thought it would cost $170 because on her website, under the ACLS section, it states $170 for the class and $40 for the textbook--so I thought I would be charged $170. But turns out that under her "class prices" section, the online course costs $110 and another $100 for the skills practice and testing course, so total of $210. Most classroom courses are around $100 to $140 (for renewal) and takes around 5 hours. The downfall is you have to go on the scheduled time available. There's really nothing bad about CPR live. It does cost more but you pay extra for the online course and the convenience of doing it on you own time, but I personally feel that it takes much longer (time spent on online course+skills testing) than a classroom course. I would probably not do this again since I would rather pay less and spend overall less time on my renewal. Just know your preferences. Gracie is a great instructor. She created a low-stress atmosphere that was very helpful for me, as it was my first time taking an ACLS course. Thank you very much. I will be back for my re-certification! Today was my third time re-certifying my BLS with Gracie and as always I enjoyed her class immensely. The class itself comprises of two portions. Part 1 is the online content that is provided by the AHA website. The information is presented in a way that is very easy to understand and I loved the audio button where you can click and the content is read to you. You can review the online portion in your own time which is great. After going over all the content, you then have to take a 25 question quiz. Part 2 is the class with Gracie where you go over what you had learned during the online portion. Gracie is very personable and informative. While performing CPR on the mannequins you are doing so along with your other classmates and aren't singled out, however Gracie keeps an eye one everyone to make sure you have the skills down. She instructs you in a way that is critical but not a criticism and you feel at ease instead of feeling nervous. I have only ever taken one other CPR class other than Gracie's which was in Long Beach for ACLS certification, only because my friend recommended it and it was cheaper than most other classes available in the area. Needless to say I passed the practical and got 25/25 correct on the written, but I did not like the class as much as I liked Gracie's class. The class was drawn out, we were forced to watch videos that we had already watched during the online portion, and when it came to the practical with the defibrillator I felt rushed and not confident that I was performing to the best of my ability. I also didn't feel like I retained the information very well afterward either. Once I have to renew my ACLS, I am definitely going to Gracie. Louie is a great instructor. The class was not boring and straight forward. Definitely taking PALS here soon!!! In order to take an EMT-B course, I realized I would have to get an AHA CPR certification. I was so glad to have made my appointment with Gracie, as she so kindly pointed out that I needed to get the BLS certification and Healthcare Provider's Card instead, in this instance. She also put me down on the same day I had registered, even if I wasn't getting the same certification I had originally signed up for. As a first-timer, learning CPR, the 2010 AHA guidelines, AED rules and regulations, and BLS functions was a breeze, both through the online practice text and test, and in person through the skills test on manikens. Gracie was a brilliant instructor who was very knowledgeable and gave us valuable input for this area - and even some tips specified toward EMT on-the-job. In two years time, when my re-certification is up, I would love to return to Gracie. I will surely be recommending this instructor to anyone else interested in BLS, CPR, and the like. Needed a BLS recertification super stat and Gracie was the only one who was able to add me to one of her classes the very next day. The best thing about this class was that Gracie creates an atmosphere of learning and she puts you such at ease that you barely remember she is testing you! Gracie also is very knowledgeable and was able to answer all the questions I had. She actually explains to you why its 15:2 for child, and not adults, on a 2 partner rescue. If you know why you are doing something, it is so much easier to remember! You can tell she really cares about teaching people how to save lives and made sure all of us were able complete the tasks in the class so that we can later use them to the maximum benefit. Like someone said in another review, she goes over the steps of all the possible scenarios with the mannequins beforehand. She also gave good tips and tricks on the correct way to do rescue breathing and chest compressions. But the best thing about taking a class with her, she will send you an email reminder one month before your CPR card expires! Was in need of a CPR cert and Google the local areas and was referred to this nice place. Had legitimate training with video's, tests and live training with dummies and my instructor james answered all questions I had. Is located upstairs in a business building. Very professional setup and service. They even accommodated my late and quick need for a card. Highly recommend them to anyone needing a cert or revert. 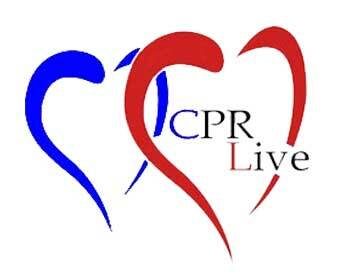 I was searching the internet for a CPR course to take that is American Heart Association approved and found CPRLive. I took the course online which was great because I was able to do it at my pace and at home not in a classroom atmosphere. I called CPRLive to take the hands on class and was able to schedule it for the next day. The class size was small and the material reviewed was appropriate and easy to understand. I would definitely recommend CPRLive to anyone who needs to take the course for the first time or as renewal. I will definitely go back in two years. Gracie is a super instructor. I've taken classroom training classes before and will never go back after having experienced CPR LIVE and Gracie. The first part of the class in on line; you get to read the material and take the exam at your own pace when it's convenient for you. The second part of the exam is done in person. Gracie wants you to be successful, so she reviews the techniques, answers questions, and perfects your technique if needed. Gracie is knowledgeable and professional. I highly recommend her course. This was my second time going to Gracie since becoming BLS certified. She is an awesome instructor. The first portion of the class is online at your own pace, and the second part is the test that is done in person. She makes you feel comfortable, makes sure you know how to do it correctly and has a sense of humor. I also like how she doesn't put you on the spot like some instructors would. It's better to learn with no stress and not being afraid of messing up. I will definitely keep going to her as long as she stays around!